These are over the counter products that are prescribed to get rid of the dark spots. Doctors recommend the use of tropical creams and lotions that contain certain ingredients such as beta hydroxy acid, alpha hydroxy acid, and retinoid. Retinol is a powerful element of vitamin A and is proven to speed up cell turnover, which helps remove dark spots from face faster. Vitamin A also helps the skin to produce more collagen, which in turn helps improve skin tone to look smoother and diminishes the appearance of fine lines. Alpha-hydroxy acid contains key ingredients such as citric acid, lactic acid and glycolic acid. These ingredients are highly recommended because they have a gentle and effective property, that’s why they’re suitable for all skin types. Beta-hydroxy acid is simply Salic acid which is commonly used to treat severe skin conditions such as acne. These ingredients are normally packaged with serums, creams, and lotions for the treatment of dark patches. A powered cleansing brush will cleanse your skin more deeply and also gently get rid of the dead skin cells that cause dark spots. When you remove the dead cells, it means you also remove the top layer of skin which is ready to be exfoliated away, thus makes the skin better able to absorb the treatment you’ll apply to stamp out dark spots. Lemon juice is well known to have natural skin bleaching properties, which can help to effectively remove dark spots on face. All you need is to combine equal amounts of lemon juice and water and then apply the solution directly onto the scars, leaving it for 15 to 25 minutes. After that, make sure you wash off the lemon juice. Alternatively, you can put the lemon juice on overnight as a mask. Aloe Vera plant has natural soothing properties which can help relieve many ailments, from burns to wounds to dark spots on face. It helps to rejuvenate and moisturize the skin, fastening the fading of the dark spots. You can buy Aloe Vera products in the drugstore, but it’s normally recommended to buy an Aloe Vera plant and use the sap from a broken leaf. The good thing about the gel-like sap is that it can be applied directly on the scar, and there’s absolutely no need to wash it off. It has powerful skin healing properties and takes less effort to prepare. The process is very simple; you just need to mix one tablespoon of sandalwood powder with a few drops of milk or rosewater to form the paste. Apply the paste and leave it for about 20-30 minutes, then wash your face. 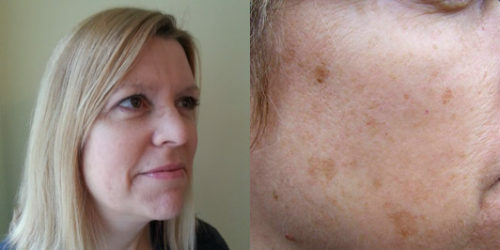 Be sure to repeat this process daily for 2 weeks to see the dark spots vanished. Turmeric contains suitable elements that are most effective in removing dark spots from your face. It is also a natural skin lightening agent for whitening dark skin. Simply mix turmeric with lemon juice and milk and apply the thick paste on the affected areas while massaging gently. Leave it for 15-20 minutes and then wash your face using lukewarm water. It helps control the pH level of your skin, thus helps to reduce the appearance of dark marks and also improves appearance of the skin over time. Use water to dilute the vinegar to half its strength and then apply it to the dark spots every day using a cotton ball until the black spots begin to fade away. .Laser treatment basically involves the use of quick pulses of light (Intense Pulsed Light) to destroy dark spots which causes hyper-pigmentation. The melanin areas absorb the light and vaporize or break. Your body heals the dark spots on the face by forming a scab and growing a new, unpigmented skin in its place. This treatment method is highly effective and is usually the perfect option when the dark spots are deep within the skin and have been there for a long time. It involves the removal of dead skin cells that cause dark spots. This is one of the most effective ways to get rid of dark spots on face naturally and promote an even skin, tone. It can be done at home using home remedies such as baking soda and honey or by using drugstore exfoliating cleansers. Using these remedies is very easy as you’re only required to apply the substance on the affected skin and massage gently. You can also use the electric exfoliators because they intensify the scrubbing to a little deep level of the skin, thus also effective. This type of treatment uses a special technique in which fine crystals are used to scrub off the dark spots from your skin and leaves a fresh layer to form. It is generally recommended that you consult an expert to perform this treatment. Limit your sun exposure because it’s the most common cause of dark spots. Consult you medical provider before using products if your body is allergic. Don’t use salicylic acid if you’re pregnant. The treatment of dark spots is more effective when treated sooner. Be sure to follow package directions if you choose home treatment methods to remove the dark spots. You should be patient when treating the dark spots on face because they can take time to fade. Always be persistent and consistent on whichever treatment you might choose. Ask your doctor to perform dark spot treatment and make sure that you follow the post-treatment instructions given very carefully.